Counterfeit goods are insidious. They're everywhere. Some are quite obvious, while others are so good it needs close inspection to tell the real from the fake, which can cause real problems and headaches. Even respectable, legitimate businesses can be taken in and end up selling dodgy items without knowing it. That does happen, albeit very rarely, since most businesses have established, proper sources for merchandise. But there are a number of places where you're very likely to encounter fake items. 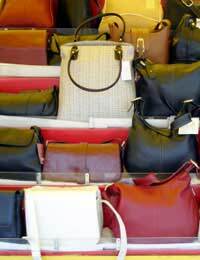 Everyone's probably seen the market stalls offering Louis Vuitton bags - probably the most-copied of them all - at ridiculously cheap prices, far too cheap to be the real thing. Many small market traders carry items like that, or knock-off football and rugby shirts. It's part of their stock in trade, although the more savvy ones won't have them on obvious display in case the officials from Trading Standards come around, which they do more and more these days. Still, a few quiet words with the right people and you can get what you want. Go to any outdoor market in the country and you can probably find something that's fake, be it clothing, trainers, foodstuffs or even a Dyson vacuum cleaner. The things people wouldn't normally imagine being faked, even brand-name toilet paper, are there. The rule of thumb is that if it seems too cheap to be real, then it's almost certainly fake. To be fair, you won't find too many designer knock-offs at car boot sales. But in amongst the tat and the junk you can often find pirated trading cards, CDs, video games and DVDs. They're usually very easy to spot - the DVDs will often have photocopied covers, and they'll generally be titles that are still on general release in the cinema rather than in the shops. The CDs won't have the full printed booklets, and the games might well only have the title handwritten on the CD. With trading cards, though, sometimes the production and presentation is very professional indeed, and it needs someone familiar with the items (generally someone who's an avid collector) to tell the real from the fake. Online auctions are a haven for the counterfeiter. It's easy to convince with a description and a photo (generally of the real thing), so it's only when the buyer receives the goods that they see it's a fake - and by then they've parted with their money. If the item is convincing enough, they might not even care, as long as they've snagged a bargain. Unfortunately, in spite of all they say and the user guides they publish, auction sites often do very little to battle counterfeiters. A good rule of thumb is that those D&G glasses, or any other expensive item that's supposedly new, with a starting price of a penny, is not going to be the real thing. The man in the pub or on the corner who says he has a good deal on Rolex watches, or who can get an Alexander McQueen dress for a very favourable price almost certainly isn't going to be dealing in the real thing (or if he is, then it's stolen). Deals done on the sly are rarely legitimate. There are also those shops that spring up overnight then vanish a short while later selling suspiciously cheap, supposedly brand-name merchandise. The odds are that it'll be fake - if they were truly legitimate they wouldn't leave as quickly and as quietly as they arrived.